The L&D’s Maternity Unit is holding an open day event on Thursday 13 July 2017 from 4.30pm to 8pm. 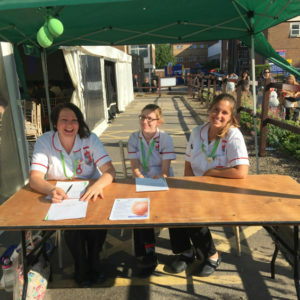 The MAMMA (Maternity And Mothers Meeting day) event will be held in a marquee on the hospital site, near the Maternity and Women’s Health building. It is an ideal opportunity for local parents, and parents-to-be, to meet our staff and also find out more about the range of services on offer at the L&D from Holistic Integrated Pregnancy Care, to our Midwifery Led Birth Centre, High Risk Obstetric Care, Caesarean Sections and Postnatal Services, and to get involved in the ongoing development of our maternity services. The new birthing pool, which has been installed following patient feedback, will also be officially opened by Baroness Cumberlege and Trust Chairman Simon Linnett. Visitors will also be asked to get involved in naming a fun Kangaroo as the mascot for the services, by coming along on the day and suggesting a name. This mascot will then be used on all future promotional and printed materials for the unit. No booking is necessary, but for more information email Stella Roberts, Consultant Midwife or Jacqueline Bamfo, Consultant Obstetrician.